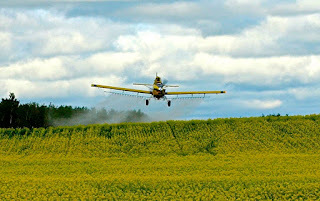 A "crop-duster" sprays a pesticide on a canola crop in Manitoba. A federal court said the US agency must prohibit the use of chlorpyrifos after seven states and DC backed the case against it. Story here. In 2,006, I told the story of a farmer in the Swan Valley of Manitoba. He said he and his family were sickened when the same chemical, chlorpyrifos (brand name, Lorsban) drifted onto his property from a field across the road. Read the terrifying tale of the Burqharts here. And listen to my report on CBC Radio (with images), below.